Digital ledgers could soon be keeping track of shipping containers like these at Rotterdam port. This paper examines the suitability of blockchain and blockchain-based distributed ledger technology (DLT) to the port, harbour and terminal industries. DLT has the potential to drastically change the world of asset transfer, asset movements and security of data movement. Testing of various DLT applications has already started – first in 2009 with the emergence of Bitcoin in the financial services industry, then subsequently in various other fields, including within the supply chain. Anyone working in the port, harbour and terminal industries needs to understand the potential impact and implications of blockchain – in business, in respect to government interactions and along the supply chain. The technology has the potential to change the way parties operate and interact along the value chain as well as to open doors for new players. Some intermediaries might be impacted, others may be left out of the game. What is 'distributed ledger technology'? Also known as DLT, this data-sharing system allows for distributed and real-time multi-party tracking, digital "bills of lading" and letters of credit, machine-to-machine interactions, and better visibility of assets and liabilities. Smart contracts, digital wallets and secure digital asset and information transfer could ease maritime operations, unlock new opportunities for all parties and reduce risk. With this, significant amounts of paper could be cut out of processes. Capturing the potential of DLT and blockchain requires not only an understanding of the technology and its implications for the port, harbour and terminal industries, but also pioneering and collective efforts to develop the applications and a new gold standard in business to jointly bring the traditional industries to the next level. The port, harbour and terminal business sits at the crossroads of the majority of global trade routes, making the sector one of the key enablers of the global supply chain; however, I believe it can also sit at the crossroads of blockchain. The supply chain is about processes from design to the extraction of raw materials, to production and the movements and storage of goods down to repurposing, including the related flows of capital and data. The fluidity of flows across the supply chain ecosystem determines time required and cost incurred. In turn, fluidity depends on the seamlessness and integrity of the processes – seamlessness means the least number of steps and the highest level of digitization and automation. Most importantly however, it stands for integrity and authenticity of information as the basis of trust among all parties involved. Blockchain became known as the core technology behind bitcoin – the first decentralized crypto-currency – launched in 2009. Although blockchain has initially been thought about mainly from a financial services perspective, the technology can serve as a basis for many useful applications and manage information far beyond monetary transactions. Blockchain technology is a leapfrog technology intended to reinvent markets. Jeremy Wilson, vice-chairman of Barclays Corporate Banking, said blockchain could even become a new operating system for the planet. That is the level of technology about which we are talking. Blockchain is a cloud-based kind of global spreadsheet or distributed ledger of transactions. Blockchains run on computers provided by volunteers around the world. Therefore, there is no central database to hack. The blockchain is public and encrypted. Although nothing is unhackable, it is extremely difficult to remove, duplicate, manipulate, tamper or copy records. Therefore, blockchain means that we can collectively trust what happens online. Blockchain is one type of distributed ledger. But distributed ledger technology (DLT) stands for blockchain-based DLT, and both terms are used simultaneously. What if information such as the provenance of goods, tariff codes, classification data, import/export data and certificates, manifests and loading lists, customs values, status information, and all other information about goods within the supply chain ecosystem was available for all parties involved at any time and everywhere? Then, the vision of a transparent, secure, paperless supply chain would have become a reality. It is blockchain and DLT that can bring track and-trace, visibility and transparency to the next level. DLT is suited to logging and monitoring data, such as parts in the automotive supply chain or containers moving in ships, planes and on other transport devises around the world. Today, customers and buyers have limited visibility and, even more so, ability to validate the true value of products and services they wish to purchase. Lack of transparency along the supply chain causes various concerns, including that the prices paid might be an inaccurate reflection of the true value. On the other hand, limited transparency also causes risks for manufacturers and brands resulting from illicit practices and the environmental impact that comes with certain forms of production. DLT and blockchain can help to reassure consumers, mitigating and eliminating risks around food security, conflict minerals, counterfeit goods, forced and child labour, corruption and so forth. In the world of DLT, everyone can watch what is happening, whether they're consumers, business partners, governments or watchdogs. There are many pioneers in the field of DLT and blockchain. Provenance, for example, applies DLT to help companies to build trust across the supply chain by making it transparent where products were made, by whom and with what environmental impact. The company BlockVerify also helps companies to fight product counterfeiting. Everledger assists companies in recording and tracking the movements of diamonds from the mine to the store. Traditionally, buyers rely on paper, which can be changed or tampered. DLT allows the recording and accessing of unchangeable information and history – any time and everywhere. Everledger is one of the first users of IBM’s blockchain platform aimed at the supply chain. IBM’s partnership with Walmart to track lettuce, steaks and snack cakes from farm and factory to the shelves is one of the biggest practical tests to date, while Maersk has teamed up with IBM. The goal for both is to develop a blockchain solution to help manage and track goods and the paper trail of millions of shipping containers by digitizing the supply chain process to enhance transparency and the highly secure sharing of information among partners – shippers, freight forwarders, ocean carriers, customs authorities, and ports. The solution, which is expected to be available later this year, has the potential to save the global economy billions of dollars. The whole world of commerce and trade is about to be rethought and redesigned. Barclays reported the first blockchain-based trade-finance deal in September 2016. The process, from issuing to approval of the letter of credit, usually takes between seven and 10 days, but could be reduced to less than four hours. Flexport, a provider of software to manage global trade might one day help businesses to monitor re-order cycles and plan future shipments, which would allow them to instantly replenish their inventory when they run low – even through placing orders from M2M. When combined with other advanced technologies, such as the internet of things (IoT) and artificial intelligence, DLT and blockchain unfold their full potential. Combining DLT with IoT allows ships to autonomously contact suppliers and place orders for example when low on energy to schedule cycles to take advantage of electricity prices. Thanks to DLT, machines can do business with machines. Blockchain brings automation to the next level. Electric vehicles can pay recharging, truck parking, tolls and fuel fees based on smart contracts with a blockchain-enabled digital wallet. E-wallets can also collect fees for equipment-sharing. Smart contracts are agreements between parties stored on a blockchain. Smart contracts work on the basis of standard templates and can, for example, refund deposits and perform instant collection of taxes as well as take over the burden of regulatory reporting. Putting documents on the blockchain brings significant advantages. Maersk has been participating in a proof of concept, with blockchain expertise from the IT University of Copenhagen, to digitize the bill of lading. Eliminating piles of papers speeds up processing and reduces costs and risks. A shipment of roses from Kenya to Rotterdam can generate a pile of paper 25cm high, for example. Furthermore, prior to arrival, ships can send digital, autonomous and secure papers, documents and information to port authorities, security departments, customs, terminal operators and all other parties involved in port operations. At the port, artificial intelligence-based tools, such as auto-document verification tools can speed up the processing of the submissions. Facial recognition technology can improve and accelerate access controls and crew checks in ports and save time and money, while raising the level of security, as DLT contributes the digital identity. Terminal operators and other asset operators can log and monitor assets and devices such as trucks, chassis, scanners and any kind of equipment on the blockchain, which offers in this way attractive cost savings, through security and efficiency gains. Sharing of assets in the port will become safer and easier. 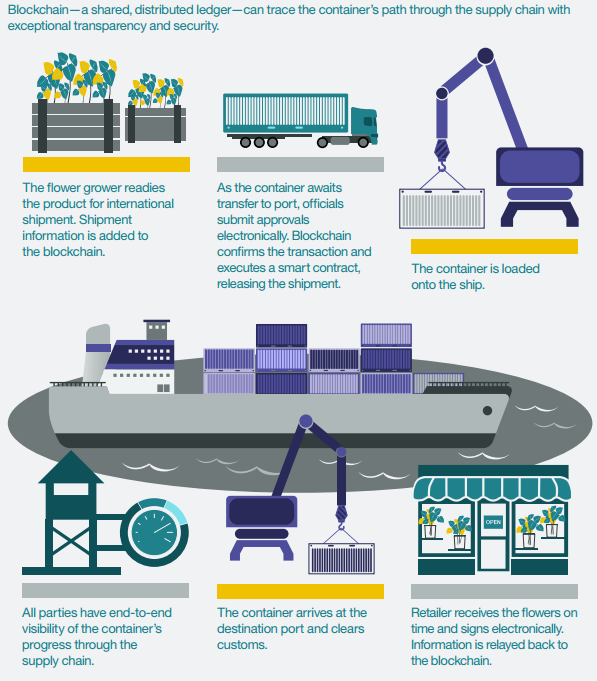 Blockchain-based open and secure platforms can also bring smaller businesses to the port, either to perform tasks in the terminals or as customers operating in the port. They can easily access the port services and connect with others via the digital port platform. Digital peer-to-peer collaboration tools and payments ease doing business. D-printing facilities operated by ports might offer a new form of safe production and an additional revenue stream. 3-D printing combined with blockchain allows the creation of secure digital memories for each product and each part of the product. The immutable records from the source of the raw materials used, to where and how products were manufactured, to their distribution, maintenance, repair, recall and recycling histories can be a vital component of the new source of trust. The joint development of standards is critical, whether on industry, national or global level to avoid conflicts between different standards and ensure the optimal outcome. Standardization of blockchain involves terminology, development, deployment and security. In the supply chain and transport industries, the consequences of missing standards are well known. For example, the desired smooth exchange of data – which eases collaboration, allows instant and better responses to disruptions, and drives optimization and security throughout the supply chain – is hampered by the lack of shared data formats and technical transfer options. In times where many physical products are digitized and almost every physical process is replicated on the digital layer that has largely taken control over the tangible world, cybersecurity has become vital for businesses, governments and the security of our lives. Boards have to take action. Companies need to recruit C-suite experts who take the board onto the journey of cybersecurity – starting with setting the board agenda. The supply chain, logistics and transport industries, including the ports, need to play an active role in the process of standardization and security. Blockchain offers the opportunity to create a global platform of performance and trust; however, scaling the technology still requires overcoming some hurdles. First, blockchain protocol(s) used to secure the ledger of global trade and manufacturers must be trusted by all users. Technical capabilities to handle very large transaction volumes need to be enhanced and the costs of maintaining the protocol need to be lowered. Gateways to bringing on board ordinary companies and individuals into the M2M economy are also required. The liability model of business conducted on the blockchain will need to be reviewed as the appropriate treatment of liability may differ from current models. Last but not least, standard skills are required to easily and smoothly interface with legacy systems to overcome concerns and doubts of the conservative forces in business and government. Collective effort and engagement is required to make DLT and blockchain the new gold standard in business. Independently from the time to realization, the final shape, form of the distributed ledger and blockchain technology, ports, harbours and terminals might significantly benefit just from exploring this central tool of the digital economy. Alone, the knowledge gathered and new relations built along the road – for example, with fintech and other tech companies – should justify the industries’ effort. This article was originally published at Port Technology.